CVD Manufacturing Inc. - The CVD process for making nickel foams, lenses, mirrors, tool inserts and for the purification of metals. CVDS's™ process consists of a fully integrated (carbonyl generation and deposition), low operating pressure, process. We have also developed highly automated state-of-the-art environment monitoring instrumentations, which are crucial for running the NVD process safely. 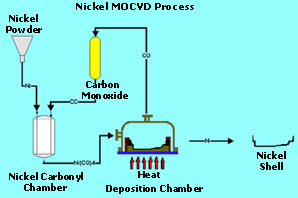 Access to new materials, high-speed information processing technology capable of real-time interface with the CVD system, sophisticated instrumentation and new designs of the CVD process technology, have made it possible for us to re-engineer the old Mond NVD process (used by mining and some tool and die shops). Security "printing" of currency, stamps, etc. The deposition process can be finely controlled, allowing the first deposited layer (usually 0.060"-0.080") to possess a higher level of hardness and tensile strength; followed by pure nickel deposition with high elongation. The properties of the deposited material are gradually changed, without any visible border layer. This reduces the risk of delamination in the final product. The nickel alloys (as described above) are examples of the many we can create by deposition. We can also modify the properties of nickel alloys to achieve hardness of up to 1100 HV. Very good uniformity of deposition.